Wordless (No, SPEECHLESS) Wednesday ~ There’s a Booger in the Dog Bowl! I don't really know what to say here, but my daughter has managed to leave me speechless on this Wordless Wednesday! She came running up to me, wanting to show me our dog's water dish. All she kept doing was pointing at it, laughing and saying "Boog!" over and over again. As soon as I looked, I knew what she was referring to...SHE ACTUALLY PUT A BIG BOOGER IN NOEL'S WATER DISH! 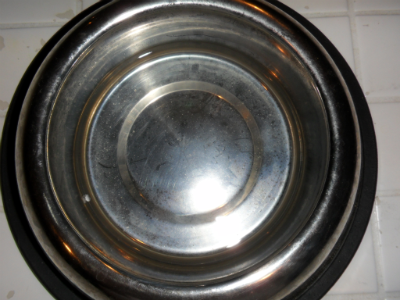 3 Responses to Wordless (No, SPEECHLESS) Wednesday ~ There’s a Booger in the Dog Bowl! I’m speechless! Sounds like something my kids would do! Well it’s better than stuck on the wall or furniture lol. Too funny! Wordless Wednesday ~ Some Days a Nice Picture is Just OUT OF THE QUESTION!